The oranges are green, the limes are yellow and there is something called a sugar apple that looks and tastes nothing like an apple at all (but is delicious). They have unusual names like jack fruit, shadow benny, star fruit, paw paw, callaloo, soursop, carambola, breadfruit and - my latest fave - christophene. I have been ever so slowly dipping my toe into these Caribbean staples. Believe me, it's not easy for someone like me. Some of this produce looks even funnier than it sounds. I had seen christophene a hundred times since we got here, I'd even picked it up and examined it at the market a few times...but each time I would put it back wondering "what the heck would I do with that?" Sure, I could have asked a market lady how to prepare it (as I have many times before) but something about the look and the name was just too intimidating, so I always walked away. The other week my friend Sharon mentioned a delicious, easy, lettuce-free, salad she had eaten. Knowing that I love salad and live on a boat with no refrigeration, she told me about it. "It would be perfect for you!" she began, "It's full of cucumbers, tomatoes and you know what else? Christophene! It was delicious". That was all I needed to break my fear. I was going to make a christophene and cucumber salad! The Christopene has the delectable consistency of a crispy green apple without the tart flavor and is actually pretty bland, but makes for an excellent salad addition because it picks up the flavor of whatever you dress it with. It also keeps very well and is about as sturdy as a squash, which makes it perfect for boaters like us who live in the dark ages without refrigeration. Here's what I did - it was wonderful, crispy and fresh! Combine all the ingredients in a bowl and mix. Chill before serving (if you have that luxury, which we do not). I think adding feta cheese, hearts of palm or artichoke hearts (I had none of these things) would be heavenly as well. We have those in Louisiana. Here they are called mirlitons (pronounced melly-tons). I've also heard them called chayote in Central America. They are delicious and are also nice cooked like yellow squash. Can't wait to try your salad recipe! Ah yes, I just discovered these too! 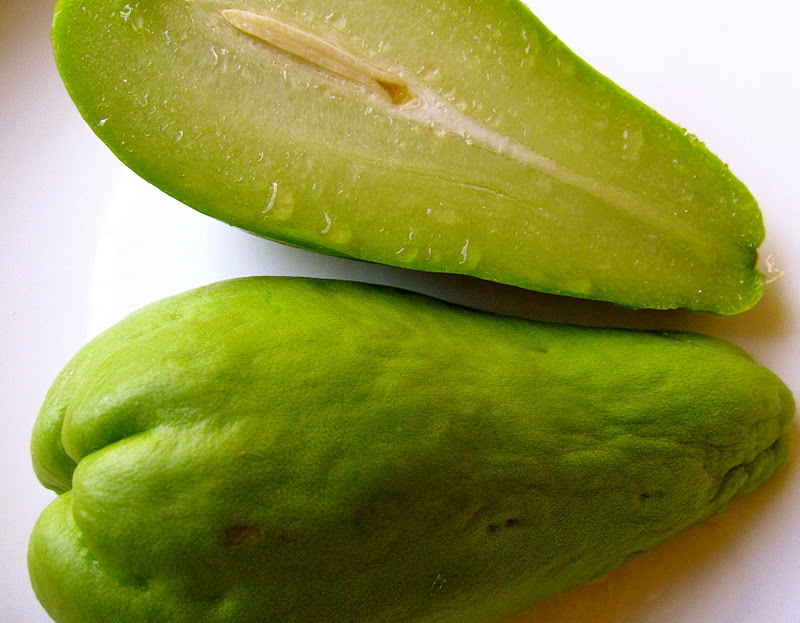 In Mexico, they are indeed called chayote. You can also sautee them with garlic, onion and butter. Love discovering local fruits and vegetables!